Our Wilmington range Medieval style bespoke oak trestle table and bench (or form as they were often referred to), in Bridge Cottage, Uckfield, Sussex. 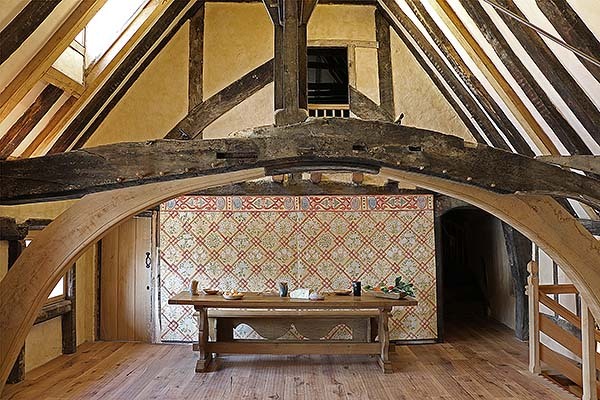 This fascinating and extensively altered and renovated 14th century Wealden hall house, is now a museum, open to the public, and regularly used for historic educational purposes. Both pieces are finished in our 'Old Flaxen' colour. To see another view, click: C16th style oak trestle table & bench in Wealden hall house and to read our managing directors blog about the venue, click: Bridge Cottage - A C15th Wealden Hall House, floored over.